This 4-1/2 inch square is the perfect companion for anyone who loves to work with the 5 inch pre-cuts on the market. The diagonal line makes trimming half-square triangles created with these 5 inch squares a piece of cake. 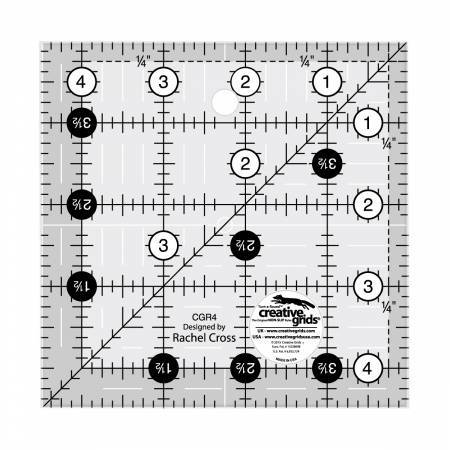 It features easy-to-read black and white markings printed in 1 inch grids marked in 1/8 inch and ¼ inch increments. Use the easy-to-read, black numbers (printed on white dots) and the 1/4 inch grip sides to cut whole inches. The 1/4 inch dashed lines printed on two adjoining sides aid in trimming seam allowances. Use the patented Turn-A-Round feature – designated by the easy to read, numerical white numbers (printed on black dots) and the 1/2 inch grip sides – to add the 1/2 inch seam allowance. The ruler slides easily over the fabric until pressure is applied. Then, our exclusive gripper holds the fabric in place while cutting, eliminating slipping and miss-cuts! A 45 degree angle is printed in black and is used to trim half-square triangles to size. White horizontal and vertical lines are printed on the square so the center of the ruler is easily distinguishable. Use these lines to square up blocks based on four-patches or embroidered and appliqued blocks. Creative Grids Rulers have a MAP (Minimum Advertised Pricing) Policy. Please do not advertise them for less than the suggested retail.